The purpose of the research study: The goal or aim of a particular research study. Hypothesis: A prediction about the relationship between or among the variables under study when the research study is being conducted. Extraneous variable: An extra interfering variable that can affect the research study. 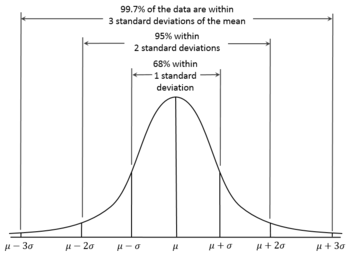 Non probability sampling: A sample where each and every person in the defined population does not have an equal chance of being selected for the sample; a sample where only some and not all members of the population have no chance of being included in the sample and/or the final selection is not done in a random manner. Sample: The group of people, for example, who will be included as participants in the research study. Quantitative research: Research that quantity and numbers. Reliability: The measurement tool and instrument measures accurately despite the fact that measurement is done at different times and/or done by different people. Likert scale: Measures how strongly a person agrees or disagrees to a particular statement. The research problem is the area of interest that the researcher wants to investigate and explore. The research problem, and the research study, should be something that is important and worth the time, effort and money to investigate and explore. For example, medical research in terms of looking into the best medicine or the best treatment of breast cancer is important and worth the time, effort and money to investigate and explore. Healthcare workers and nurses often find things to research. They may notice a need for research after reading scientific literature and journals; they may see or hear about a problem in their hospital or among a group of patients that should be further investigated; they may be curious about a new or better way to take care of their patients that should be further investigated; and they may have to look into an area of weakness that has been identified as the result of some quality assurance or performance improvement study. The purpose of the study reflects the research problem but it is a bit more detailed and formal. The purpose of the research study is the goal or aim of a particular research study. The purpose of the research gives us an idea about why the research is important, what the researcher will do, where the research will be conducted, and who will be the subjects or the participants in the research study. For example, a statement such as "The purpose of the research is to examine the timeliness of nursing assessments among elderly patients in the hospital" is a statement of the purpose of the research study. The literature review is an intense, complete, comprehensive, systematic selection, reading, summarization, and critique of all pertinent literature relating to the research activity and any concepts included in the study. The primary purpose of literature reviews is to give the researcher more in-depth information and understanding of the topic of interest. The review of the literature is critical not only for a greater understanding of the topic of interest, it is also a very effective way of giving the researcher ideas about how to design the study in terms of variables, concepts, subjects, sampling, and data analysis, among other things. Some of the many sources of literature are journals, other research studies, newspapers, and interviews with people. The next step is to identify the foundation or theory for the research study. This theoretical framework is the building blocks upon which the research study will be based. It helps the researcher to explain the phenomenon, or variable that will be investigated in the research study; and this theoretical or conceptual framework also can give the researcher the ability to predict the outcomes of their research study. For example, if a researcher is using Selye's theory of stress (General Adaptation Syndrome) as their conceptual or theoretic framework for a research study relating to the stress levels among people who will be getting open heart surgery, the researcher can correctly predict that these patients will have physiological changes, such as an increase of their heart rate, as a result of the stress that they are experiencing and as stated in Selye's theory of stress and facts about the General Adaptation Syndrome. A hypothesis, simply defined, is a prediction about the relationship between or among the variables under study when the research study is being conducted. For example, a researcher may state that "The pulse rates of patients who will be getting open heart surgery will increase according to the amount of fear and stress that they are experiencing as a result of this pending invasive surgery." A null hypothesis is accepted when the research does not accept or refute the research hypothesis. The research design is the plan for the research study. This plan outlines how the study will be conducted and how the data will be analyzed. * An extraneous variable is an extra interfering variable that can affect the research study. Probability sampling is a sample where each and every person in the defined population has an equal chance of being selected for the sample. Members of the sample are then randomly selected to be a part of the research sample. In contrast to probability sampling, non probability sampling is a sample where only some and not all members of the population have no chance of being included in the sample and/or the final selection is not done in a random manner. The sample, simply defined, is the group of people, for example, who will be included as participants in the research study. The size of the sample and the type of the sample is determined with the research design and both the size of the sample and the type of the sample are very important to a sound scientific research process. The first thing that a researcher does is identify the population of people that will be explored and investigated in the research study. If, for example, the researcher wants to investigate how infants less than 6 months of age respond to some tactile stimulus, you are using infants as the population that will be explored and investigated in the research study. Because it is impossible and not feasible to conduct research with ALL infants less than 6 months of age throughout the world, the research must limit the size of the sample to a sample size that is feasible and manageable. After the number of subjects in the research sample is determined, the researcher will then select the sample of research subjects, or participants, using a method that is scientifically sound and not biased. For example, a sample can be selected as based on randomness and using random numbers that have been assigned to specific people. The size of the sample that is needed for sound scientific research varies. For example, if a person is doing research about the safety or the efficacy of a new medication, the sample size will be greater than a small research study within a healthcare facility. Legal and ethical issues require the attention of the researcher and the research group particularly when they are studying and investigating humans and their responses to an experimental intervention. Humans can NEVER be used as "human Guinea pigs" GETTING exposed to harm. Additionally, all subjects must consent to be included in a research study. Measurement is used to collect data relating to research studies. Quantitative research is the most commonly used type of research. Quantitative research, as the name suggests, deals with quantity and numbers. Statistical analysis is done with collected and data is collected with a number of different measurement tools including a blood pressure machine, a thermometer and even a survey which can be quantified into numbers that can be analyzed with statistics. Qualitative research, on the other hand, is less frequently used than qualitative research, it does not deal with quantities and numbers and the collected data is not analyzed with statistics. Qualitative research, however, does include the collection of data but this data is words and not numbers. Data for qualitative research is collected with things like intensive interviews of subjects and case studies. Data and data collection can include measurements that are physical, psychological, and/or behavioral. Examples of physiological measurements are things like blood pressure, pulse rates, and blood glucose readings. Physiological measurements are often done with a piece of equipment and, at other times, the person collecting data for a research study will use one of their empirical senses to collect data. Psychological measurements include measurements relating to feelings, beliefs and attitudes. Psychological variables, in contrast with the measurement of physiological variables, are not measured using measuring equipment and the empirical senses. Instead, the collection of psychological data and psychological measurements require the use of a measurement tool or instrument, such as a questionnaire or survey for collecting data. Examples of psychological data measurement tools include a survey or questionnaire about a person's level of pain or the person's degree of satisfaction with the care that they are getting from the healthcare team. Behavioral data is collected and measured most often using a structure observational method of data collection. Examples of behavioral data include things like interactional patterns, reactions, anger behaviors and sleeplessness. Measurement tools and instruments must be valid and reliable in order to be scientific and usable in research. Measurement tools and instruments are considered valid when they actually measures what it is supposed to be measuring; and a measurement tool is considered reliable when it consistently and accurately measures the phenomenon or variable that is being explored despite the fact that measurement is done at different times and/or done by different people. A valid and reliable tool resists differences despite time and data collector variances. Observation, interviews, questionnaires, rating scales, and physical measurements are perhaps the most commonly used data collection procedures in research. Researchers must insure that data collection procedures are done in a consistent manner, as per plan, to insure that the research is accurate, credible and unbiased, regardless of the data collection method that is used. As stated previously, quantitative data is numerical so it is analyzed with mathematics, including statistics. Qualitative data, on the other hand, is narrative. This data is analyzed with the identification of patterns, trends and themes found in the lengthy narrative data which is most often obtained using interview data collection techniques. The results of the research are reported and documented. Research results from a quantitative study are related in terms of statistical results, statistical significance and a full narrative discussion of the results of the study. Research results from a qualitative research study are reported in the narrative form. Tables, charts, diagrams and the like can be included for both types of research. Researchers usually discuss and present the findings of their research study and it often connects the ideas found in the review of the literature with the results of their current research study. The conclusions of the research study are summarizing statements that relate to the data. The implications of the research study are usually statements and narratives that relate to why the study was an important one and how the study can be used by others. For example, when a research study finds that group teaching for diabetic patients is more effective than individual one-to-one instruction, the implications may suggest that group teaching for diabetic people be used rather than one-to-one instruction. The limitations of the study include statements about why the results may not, and should not, be immediately used and/or applied to different populations. The recommendations of the study include things like suggested ideas for future research studies. References are cited for every source that was used in the review of the literature and the research report itself (articles, research studies, interviews, newspaper articles, etc.). The last step of the research process is communicating results. There are many methods that researchers use to communicate and transmit research findings to others. Some of these vehicles for communicating results include professional publications, poster sessions, seminars, video presentations, and live presentations to local groups. Descriptive statistics organize and analyze large amounts of data in order to get some perspective or context. 73 (the sum) is then divided by 3 (the number of values) is 24.33. The mean or average of these numbers is, therefore, 24.33. The best way to determine the median, or the middle number in a series of numbers, is by putting the numbers in either ascending or descending order and then finding the number or value that is in the middle of all the numbers or values. 69 is the middle number or median for the above series of 5 numbers that were placed in ascending order. When there is a series of numbers with an even number of numbers in the sequence, the median is the average of the two numbers in the center, as shown below. 69 + 72 = 141 divided by 2 = 70.5 so the median for the above sequence of numbers is 70.5. Lastly, the mode is the number that occurs most often in a set of numbers. The mode for the above numbers is 22 because 22 is the only number that appears two times in this set of numbers. The T-test and the Chi-square test tell us if the findings of the research study are, or are not, statistically significant. Simply stated, statistical significance tells us how much of the results occurred as the result of chance and how much of the results were due to the manipulation of the variable in the research study. For example, when the result of T test is p < .03, it means that there is a less than a 3% possibility that chance or accident has occurred and that means, then, that 97% was related to the research intervention and p < .10 means that there is a less than a 10% possibility that chance or accident has occurred and that means, then, that 90% was related to the research intervention. It is virtually impossible to prove causality in research, especially when it comes to human subjects. There are more babies born in areas where there are more storks than in surrounding areas with fewer storks. So, what does this statement really mean? If you giggled, you assumed causality. You thought, "No, storks do not deliver babies". You are correct. Storks do not deliver babies. There is no causality between storks and babies. There is, however, a positive correlation between the number of storks and the number of babies born. There are two types of correlation. Correlations can be positive or negative. A positive correlation occurs when both the independent and dependent variables increase or decrease. A negative correlation occurs when one of the variable increases and the other variable decreases. The stork statement above reflects a positive correlation where both variables increase (both the storks and the babies increase). The above are somewhat complex and not within the scope of this review. Research studies have both independent and dependent variables. A dependent variable is the factor that changes as a result of the influence of the independent variable. It is the behavior , outcome or characteristic that the researcher hopes to predict or explain. A dependent variable changes as a response to some manipulation. For this reason, a dependent variable is sometimes referred to as a response variable. Extraneous variables, which are also called, interfering variables, are conditions that undesirably impact on the dependent variable when the research aims to only identify the impact on the dependent variable by the independent variable. For this reason, researchers aim to eliminate all extraneous variables. 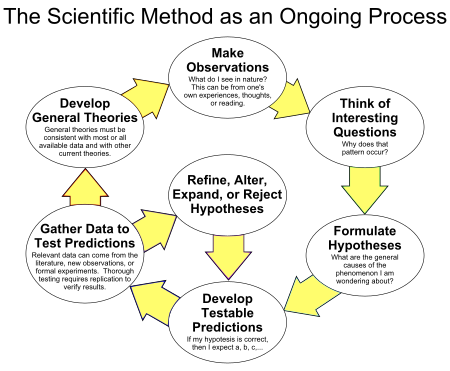 The scientific method as a cyclic or iterative process. A hypothesis is defined as an "educated guess" and an "educated prediction" about the relationship between or among the independent and dependent variables in the research study. As shown in the diagram above, arriving at a hypothesis occurs after the review of the literature is completed and the researcher has developed the research question or the research problem, as discussed above. Hypotheses are testable and they can be supported or refuted, however, they cannot be found true or false; they can only be supported or refuted. The null hypothesis is a default hypothesis. It states that there is no relationship between the independent and dependent variables. Data collection is essentially collecting data regarding the variables that are going to be studied. Validity, simply defined, is the ability of the measurement tool to measure exactly what the researcher wants the tool to measure and nothing else. The reliability of the measurement tool is its ability to measure things accurately regardless of who collected the data and when the data was collected. It is consistent in terms of time and the person collecting the data and using the measurement tool. A scale is a measurement instrument, or tool, that is most often used on a questionnaire or survey. This TEAS reviews is effective. The Likert, or Likert type, scale measures how strongly a person agrees or disagrees to a particular statement. Guttmann scales measure the intensity and degree of feelings about a specific thing. People guilty of hate crimes should have to do community service in addition to one week in jail in addition to their regular sentence. People guilty of hate crimes should have to do community service in addition to one month in jail in addition to their regular sentence. People guilty of hate crimes should have to do community service in addition to one year in jail in addition to their regular sentence. This type of scale as a measurement tool lets people select only one response or multiple responses. Check all the responses below that you agree to. ____ This TEAS review course has been simple to understand. ____ This TEAS review course was too short in length. ____ This TEAS review course was too complicated. ____ This TEAS review course was professional in appearance. ____ This TEAS review course met my learning needs. ____ This TEAS review course was stressful to me. Data collection techniques are determined during the planning phase of the research design. Like most other things in research, and in everyday life, each technique has its advantages and disadvantages.